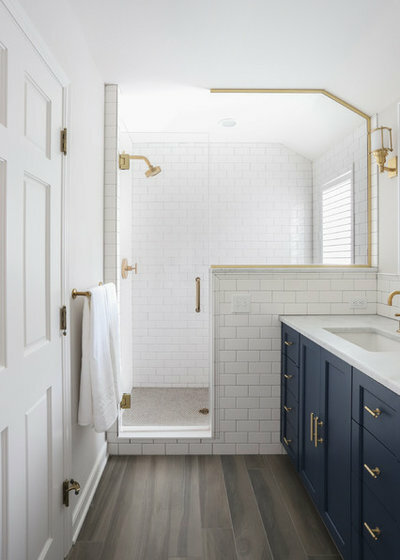 This Trending Now story features the most-saved bathroom photos uploaded to Houzz since Jan. 1, 2019. 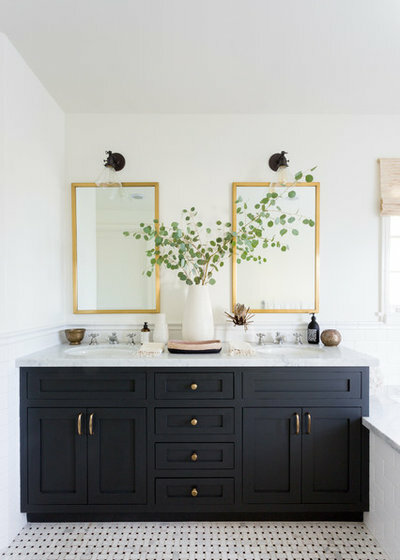 A glance through the most popular bathroom photos uploaded to Houzz so far this year reveals that many users are inspired by polished industrial looks and fresh takes on classic bathroom design, as well as bathrooms that combine natural wood finishes with crisp white. 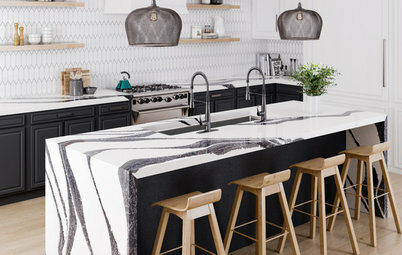 As for tile trends, hexagonal, elongated subway, large-format shapes and herringbone and chevron patterns made strong appearances. 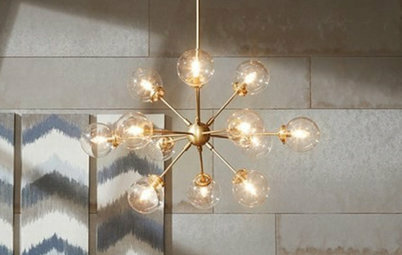 Take a look to see if any of these emerging bathroom trends strike a chord with you and your renovation plans. TreHus tries on a preppy look — its navy blue vanity adorned with gold accents resembles a blazer you might see at a yacht club. And the digitally printed porcelain tile floor has a beachy driftwood look. Double vanities equipped with two sinks continue to entice couples who share bathrooms and people whose children share a bathroom. 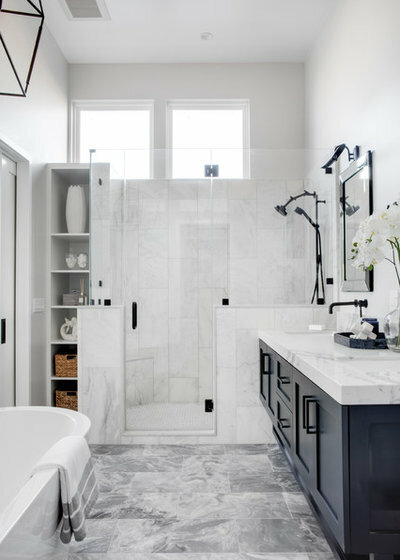 In this classic black-and-white bath by JDP Interiors, the pair of mirrors with matching sconces overhead enhances the pleasing symmetry. Tip: Cut eucalyptus branches can bring some aromatherapy into a bathroom. Crush a leaf for a relaxing scent while bathing or showering, or take in its scent before going to bed. 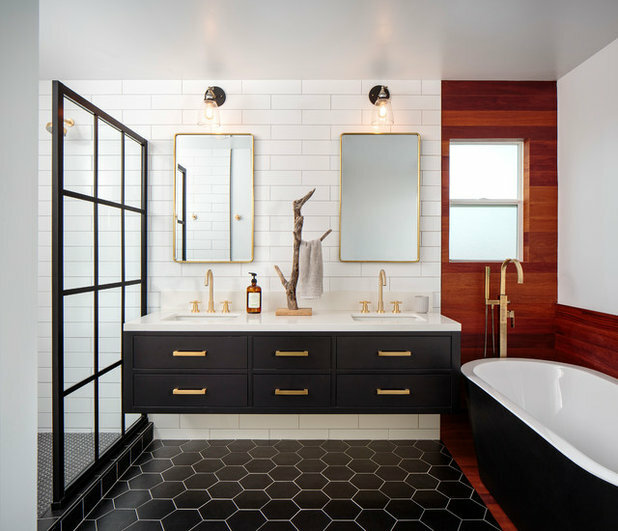 This bathroom by CM Natural Designs combines industrial-inspired elements like a black divided lite shower enclosure, subway tile and sconces with warmer touches like warm metal and rich wood accents. 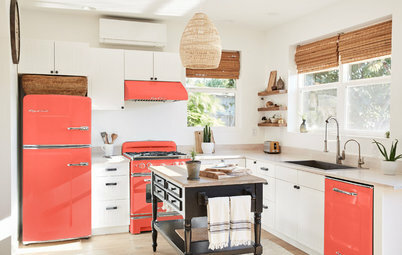 Elongated subway tile and crisp, clean lines refine the industrial inspiration. The elegant wood defines the bathtub area and the floating vanity allows the hexagonal tile floor to extend all the way to the wall. The simple silhouettes and monochromatic color scheme lean industrial in this bathroom by building Lab. But the variation in gray-brown tones in the Heath Ceramics shower tile lends an earthy vibe. 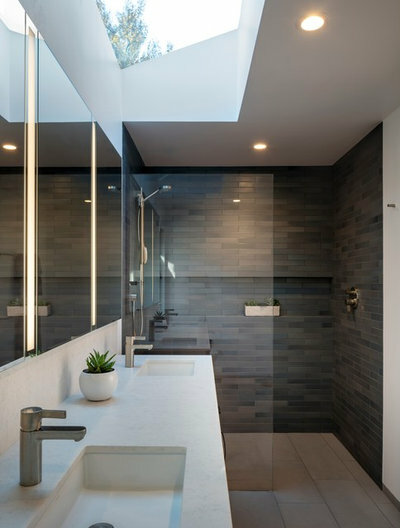 Clean lines and the clear frameless glass shower enclosure maintain a minimalist look. And natural light streams into the room from the skylight. 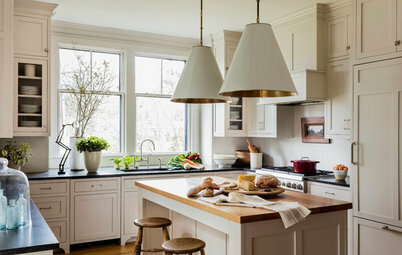 Classic black-and-white schemes have also been popular among Houzz users lately. 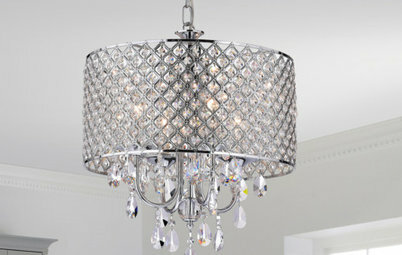 But often today’s designers are adding a tone or two more to the mix. 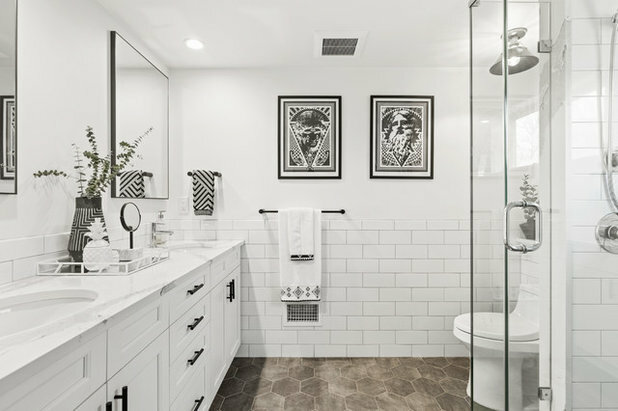 In this bathroom by Three Salt Design, the floor tile and vanity add pattern and shades of gray to the scheme. 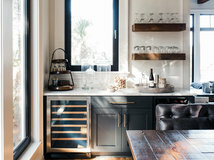 This room also demonstrates the continued popularity of clear frameless glass shower enclosures and the somewhat newish popular finish of matte black for faucets and hardware. And this bathroom by NDA Kitchens and Construction sticks with black and white with the exception of the hexagonal floor tile, which grounds the room with earthy tones. 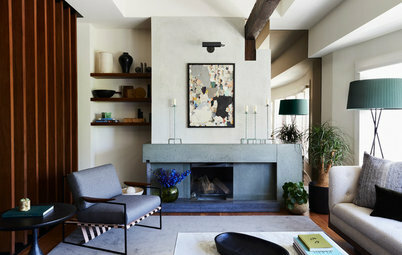 The artwork, towels and vases bring some patterns into the room. Too much white in a bathroom can make it feel too sterile. However, a good dose of wood warms it right up. 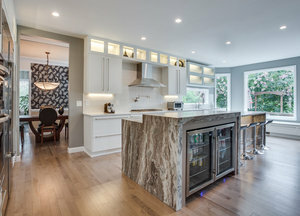 Natural wood finishes on vanities work well with the veining patterns of natural stone and quartz. 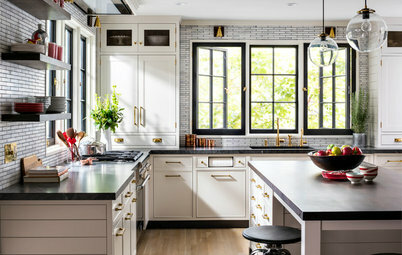 Working with designer Saoli Chu of Block Renovation, this couple accomplished their goal of classic-meets-contemporary style. 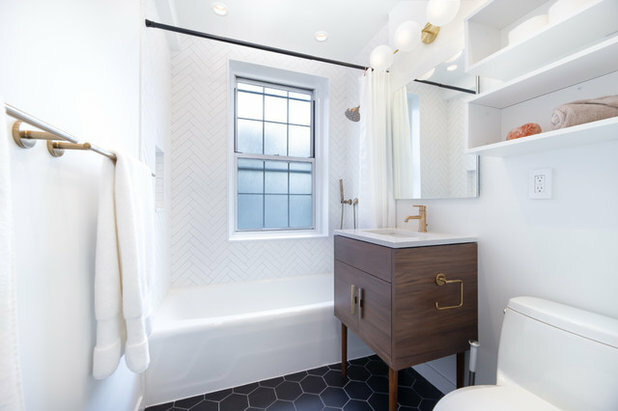 White walls, shower tile laid in a herringbone pattern and a black hexagonal tile on the floor offer new twists on classic elements, while a furniture-style dark wood vanity adds a warm eye-catching touch. 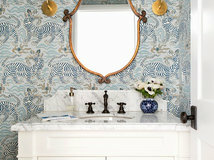 When faced with designing a long, narrow bathroom, interior designer Andrea West just went with it. 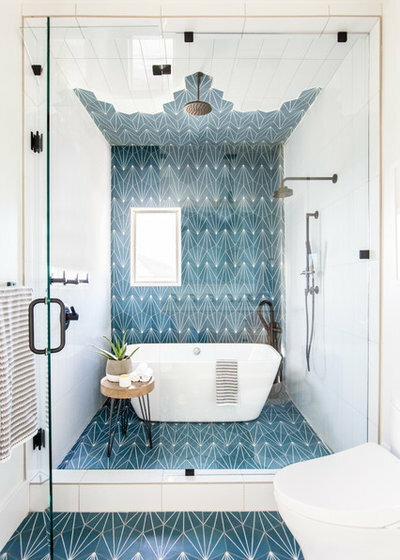 She used playful geometric tile that extends from the floor up the shower wall and onto the ceiling. 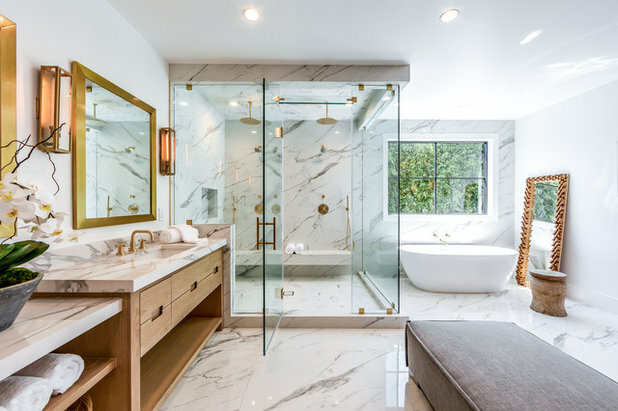 And she managed to squeeze in a shower and freestanding bathtub by placing them both behind the clear glass shower enclosure. 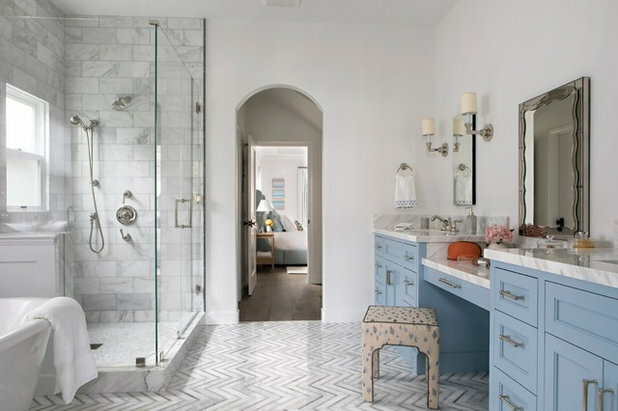 Interior designer Paige Pierce enlivened this bathroom floor with marble tiles laid in a dynamic chevron pattern. 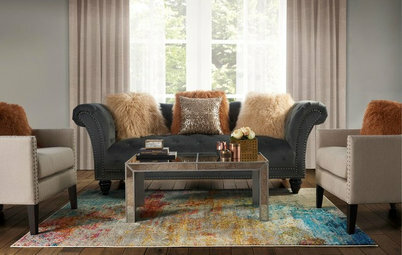 A playful animal-print stool, powder blue vanity and smoky mirrored frame add the homeowners’ personalities to the classic design. 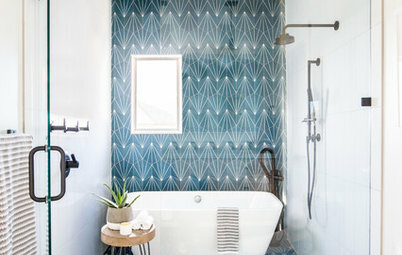 Your turn: What are your favorite bathroom trends? Tell us in the Comments. @chelie47 - to answer your question, what's the tub and the tile in the picture below... The tub is Itan American Standard Cadet freestanding tub that was purchased with the faucet hardware all as one package. 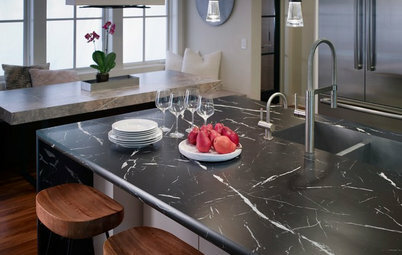 The tile is American Florim Stratos-Porcelain shown in "Anthracite. 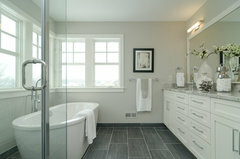 The wall paint is also Sherwin-Williams Wordly gray and the vanity is Classic White from Dura Supreme. They matched the Classic White paint for all of the trim and windows as well. I would not like to be the one who has to clean around the backside of the tub on some of the bathrooms? Looks hard to get to.